Up until the Revolution, Aubeterre was home to no less than three religious orders, the monasteries of the Minimes and the Cordeliers, as well as the convent of the Clarisses. The Monastery of the Cordeliers. cloitreThe Cordeliers, established in Aubeterre in the 13th century became important land owners in the area. 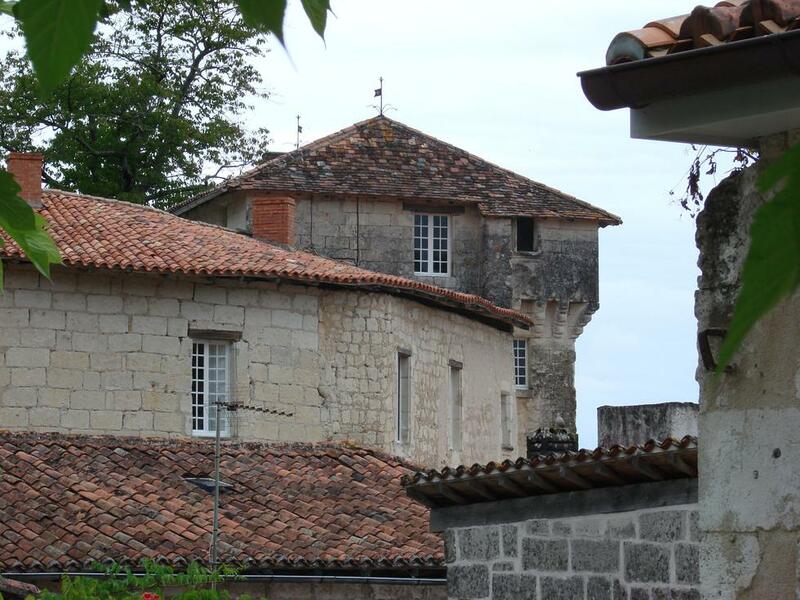 They also controlled the Hospital (“hostel”) at the foot of the village, which was where they welcomed and cared for the pilgrims en route to Santiago de Compostela. Their monastery was destroyed during the wars of religion and all that remains of the building is a fresco on the wall of a private house; it comprises an arch and three niches decorated by shells of St.Jacques, such scallop shells being the ornamental motif of the Italian renaissance in French architecture. Following their expulsion the Cordeleirs were replaced by the Minimes. 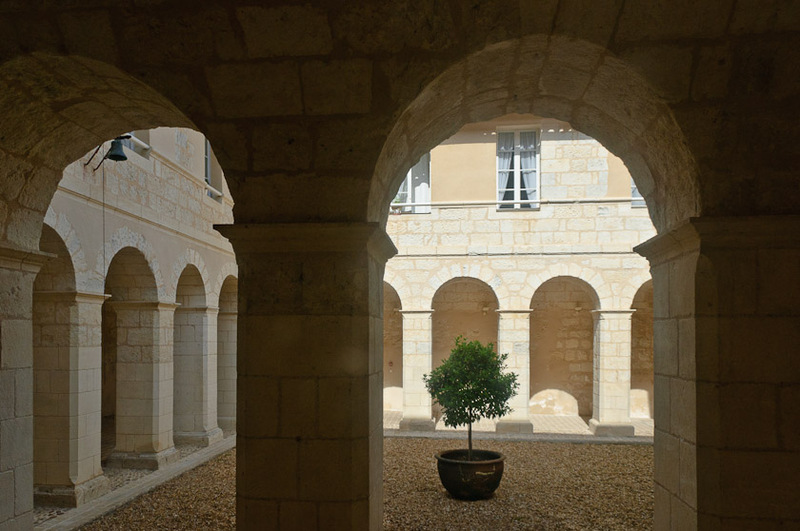 Founded in 1617 by the Marquis of Aubeterre, François d’Esparbes de Lussan and his wife, the monastery is now a privately owned nursing home. The public are welcome to visit the chapel and the cloisters beyond, the latter having been entirely restored in 1995. The Minimes came from the Monastery of Blaye in the Gironde, to settle in Aubeterre at the beginning of the 17th century.One of the grand orders of poverty, like the Franciscans (Cordeliers) from which they originated, the Minimes arrived in Aubeterre after the expulsion of the Huguenots with the aim of restoring the religious authority of the Roman Church. The monastery has a classical architecture dating from the 17th century but shows a mixture of styles – late Gothic for the bay windows, whilst the cross vaults are based on Baroque capitals. The great classical altarpiece dating from the 18th century is particularly noteworthy. It is rare to see such a large stone altarpiece in a rural church since they are usually in painted wood in the Baroque style. Below the altarpiece, a carved and painted relief shows an asymmetrical composition of angels holding suns in their hands. The quality of the stonework and the balance of the composition of the cloister is something of an architectural achievement. Other cloisters still intact in the area can be visited at Chalais, Cognac and La Rochefoucauld. The Sisters of St Claire also established themselves in the village following the wars of religion in 1620. They welcomed the daughters of good families who wanted to retire to the convent. After the French Revolution, the convent, like many other religious buildings, was sold to the State, and it is now a large private property. The façade is embellished by a tower dating from the 17th century. Before becoming a convent, it was a fortress protecting the heights of the village and stood opposite the chateau which dominated the Dronne valley. All that remains of the chateau is the small fortified entrance, dating from the 16th century, which is now a private house. The main body of the building was completely dismantled stone by stone when the last owner sold it in 1820. TRARIEUX was born in Aubeterre on the 30th November 1840. A brilliant pupil, he became a lawyer at 22 yrs of age and was accepted as a barrister at the Bar of Bordeaux at the age of 37. He went to Paris in 1881, became the Member of Parliament for the Gironde and then Senator until his death. On the 19th of December 1894, the infamous trial of Captain Dreyfus opened, convinced of his innocence, Trarieux went on to become the indefatigable defender of the accused Captain and in so doing, sacrificed his professional and political career. In rejecting the military accusations and confronting the nationalist and anti-Semitic activists, Trarieux devoted himself to the passionate struggle for the defence of freedom and justice. Trarieux was a witness during the trial of Emile Zola in 1898, after the publication of the “J’Accuse”. After consulting many friends, on 4th June 1898, Trarieux established The French League for the defence of the Citizen and Human Rights and went on to become the first President. On the 14th July 1898, the first manifesto proclaimed “From now on, every person whose freedom is threatened or whose rights are violated, is assured of receiving from us, help and assistance”. On the 12th July 1906, the guilty verdict of Dreyfus was overturned. Sadly Trarieux had died 2 years before, happily the League for Human Rights, with many thousands of members, including Doctor Gaillardon of Aubeterre, expands throughout the world in the defence of freedom and democracy. In 1985, the Institute for Human Rights of the Bar of Bordeaux created an International Prize in the name of Ludovic Trarieux, offered to” a lawyer who, through his work, his activity, or his struggle, has defended Human Rights, and in particular, the fight against racism and intolerance in all its forms”. Nelson Mandela was the first Laureate. everyone of the history of this famous citizen of Aubeterre sur Dronne.